As this is written, (Edited, really) I’m preparing to go to bed. I have to leave at 3am for Southern PA from my western NY home, to make a 10am delivery. As such I really don’t have a bunch of time to write a new thought for this thanksgiving day. Fortunately, I have several years worth of writings to lean back on. Here’s a post I put up a couple years ago, on the subject of Thanksgiving, and as usual, it takes a cultural bend…. A traditional Thanksgiving meal between two elementary schools in Claremont, California, has parents in an uproar over costumes. 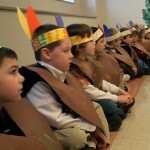 The kindergarteners have long celebrated the holiday by dressing up as pilgrims and Native Americans and taking turns visiting the other school to share in a holiday feast, but parents this year are divided over what the costumes represent and whether they should be allowed at all. The Los Angeles Times reports after a school board meeting last week, officials decided to hold the meal without costumes. That decision angered the parents who supported the original event. Well, just so. Kids have been dressing up and taking part in Thanksgiving plays, since the Civil war. It’s my view we risk losing ourselves in all this sensitivity. I can’t help but wonder if it isn’t the case that at least some of the noise we hear on days like this, isn’t aimed at exactly that. I mean, how much more dispiriting a message can we send our kids than our own culture and history isn’t worth a damn? Welcome to government schools. Ah, yes… Government schools. Always a battleground anymore, over exactly this. The comparisons Raheja draws are incredible on their face, but so too is the overall position being taken. It does, however have the action of prying us from our American heritage. That always seems the goal of such actions, doesn’t it? And the teachers and administrators seem to be willing participants in such battles… on the side opposite of American values. Sometime ago I read a quote from an educator who later went on to political life, whose name I can’t recall at the moment. If any of you can remember the quote I would appreciate passing it along in the comments. But paraphrasing, he said the intent of education was to get students to come out different than their parents. While there may be positive aspects involved with this, I have come to regard this as particularly ominous, given that at least part of the task the quote assigns educators, is to alter the culture, by teaching the students values which their parents do not share. You can certainly understand, therefore, why so many consider Catholic and other religious-based schools to run afoul of their vision of what Education is for; As I’ve said these tend to teach the cultural values which have been handed down generation by generation. As a result of decades of this brand of “education’, we’ve become sensitive to the point of active denial of our own heritage. Our own story isn’t known to our kids… and the bit Hume speaks of, proves that… and it also shows us the narrative that IS being pushed… that the US is the enemy of everyone. Because of that long standing effort to demoralize the United states…(in every meaning of that phrase)… perhaps even some of you are unaware of the origins of this day being set aside as a national day of Thanksgiving. Let’s examine the day’s history and historical meaning, shall we? Let’s start with the fact that Ol’ Ben Franklin wanted to make the Turkey the national bird, thinking the Eagle a bird of Bad moral character, a rank coward. ‘course now, the turkey Ben Franklin knew was brightly plumed, and a rather cunning bird… and not today’s bird, so darned fat he couldn’t fly… such a creature would have never made it in a world of predetors. So, had Ben had his way, the turkey would be in the endangered species list, and we’d all be eating roast Eagle, with all the trimmings, I suppose. Seriously, though… some of you wonder who we’re thanking, and for what. A look back will answer these questions, and possibly give you a new perspective on things. NOW THEREFORE, I do recommend and affign THURSDAY, the TWENTY-SIXTH DAY of NOVEMBER next, to be devoted by the people of thefe States to the fervice of that great and glorious Being who is the beneficent author of all the good that was, that is, or that will be; that we may then all unite in rendering unto Him our fincere and humble thanksfor His kind care and protection of the people of this country previous to their becoming a nation; for the fignal and manifold mercies and the favorable interpofitions of His providence in the courfe and conclufion of the late war; for the great degree of tranquility, union, and plenty which we have fince enjoyed;- for the peaceable and rational manner in which we have been enable to eftablish Conftitutions of government for our fafety and happinefs, and particularly the national one now lately instituted;- for the civil and religious libertywith which we are bleffed, and the means we have of acquiring and diffufing useful knowledge;- and, in general, for all the great and various favours which He has been pleafed to confer upon us. In 1863, Lincoln had cause to be thankful, as well. Needful diversions of wealth and of strength from the fields of peaceful industry to the national defence, have not arrested the plough, the shuttle or the ship; the axe has enlarged the borders of our settlements, and the mines, as well of iron and coal as of the precious metals, have yielded even more abundantly than heretofore. Population has steadily increased, notwithstanding the wastethat has been made in the camp, the siege and the battle-field; and the country, rejoicing in the consiousness of augmented strength and vigor, is permitted to expect continuance of years with large increase of freedom. No human counsel hath devised nor hath any mortal hand worked out these great things. They are the gracious gifts of the Most High God, who, while dealing with us in anger for our sins, hath nevertheless remembered mercy. It has seemed to me fit and proper that they should be solemnly, reverently and gratefully acknowledged as with one heart and one voice by the whole American People. I do therefore invite my fellow citizens in every part of the United States, and also those who are at sea and those who are sojourning in foreign lands, to set apart and observe the last Thursday of November next, as a day of Thanksgiving and Praise to our beneficent Father who dwelleth in the Heavens. Of course Thanksgiving in it’s current context would be eventually declared unconstitutional, if we allow the courts to run things. the bit that Hume speaks of is exemplary of how that course is run. And perhaps that’s something we ought to remember today, as well.. and be thankful that they’ve not gotten that kind of power from us, yet. That, I am certainly thankful for. (May they NEVER have such power!) If original intent counts for anything in the realm of the Constitution, and I think it does, these proclamations should end the argument about claims of separation of church and state.. and the push toward the removal of the one we should be thankful to, today. While we can and should have debates within the political arena as to the correct role that religion should play in contemporary American society, that debate should be settled democratically by voters, not capriciously by judges. Liberals have often enjoyed success in the courts when they have failed at the ballot box, such as with broad interpretations of the Establishment Clause, these precedents set by our greatest Presidents demonstrate that America’s cultural underpinnings were never based on atheism. Well, that touches on the historical and cultural background. But there’s a more personal meaning as well. I’m going to tell you to have yourself a good Thanksgiving. But what do I mean when I say that? Look, here it is; even with everything going on, today, we have a lot to be thankful for. Myself, for my family, that I have a fairly good job, and so on. Worth celebrating, every one of them. Please…. Pay attention to those around the table with you this day. Look them in the eye. Let them know. Give thanks for them while you have them. Consider that no relationship is forever, since we are all mortal. Put aside what petty differences you have with these special people in your life, for special they are. Alas!, that many of us find out how special they were only after they are gone from us. I think there’s no pain deeper than that belated understanding. Celebrate those relationships today and celebrate that whatever else happens, you are together, on this day. Also think about the fact that the small mountain of food on your table, today, is possible because we are still a blessed and semi-free nation. Such feasting is possible only in nations that are free. I happened to spend a few minutes in the atrium of Atlanta’s Hartsfield International Airport. (Oh wait… it’s now “Hartsfield-Race-Grifter-Maynard-Jackson International Airport”. I almost forgot.) Sitting there, I observed a line of troops in desert camo, standing two-abreast in the outlet of a corridor into the atrium space. On a signal, they took up their gear and began to move out, in column. They made their way through the atrium, and the whole place — perhaps three hundred people (it was early) — stood up as one, rendering a thunderous ovation for the whole time that the troops were in sight. Lamed by the spectacle, I couldn’t move to get out my camera. I wish I had, though. It was terrific. So, you get into that situation, stand up and bang your hands together. You’ll be amazed how many others join in, and at the smiles of the uniformed. It’s a feeling you won’t soon forget. Pay heed today to the fact that freedoms unguarded do not abide forever, and that with the kind of business Hume talks about, and what we’ve seen of late, the last year or two, those freedoms may not outlast us, and as with family, many of us find out how special they were only after they are gone from us. In looking over this post I see I sound a bit more cautionary than I have in years past. Perhaps it’s advancing age, perhaps it’s the political climate, perhaps it just a better understanding of all this, perhaps it’s a combination of all of them, I don’t know. But I’ve never held back from you what I was thinking before and I’m not about to start at this late date. Again, have a good Thanksgiving, today.